The wish list was costly: Legislators wanted to fund new preschool slots, restore money for mental health clinics and put more funds into emergency medical service coordinators. But as it came time to finalize the state budget this spring, money was getting tight. And so, lawmakers found the funds for preschool and the other programs by turning to a familiar escape hatch: the settlement money from tobacco companies. Connecticut has received nearly $2 billion over the past 15 years as part of a legal settlement meant to compensate states for the toll of tobacco. But, to the consternation of anti-tobacco advocates, the state has spent only a tiny fraction of it to curb smoking, the cause of an estimated 4,700 deaths here each year. Instead, lawmakers have repeatedly used the money as a crutch to help balance the budget. Even the money designated for a special fund for anti-tobacco efforts and other health programs has repeatedly been raided by lawmakers to cover other expenses. Bryte Johnson, the government relations director for the American Cancer Society Cancer Action Network, said the programs lawmakers funded this year with tobacco settlement money address worthy causes. But none address problems that kill as many people as smoking does, he said. But while Johnson and others push for the state to spend more on anti-smoking efforts, several fiscal projections suggest even the modest sums now devoted to that cause could be imperiled in the coming years. Connecticut gets lots of money from smoking. A $3.40-per-pack levy on cigarettes and small taxes on snuff and other tobacco products are expected to bring in about $375 million this fiscal year. That money goes into the general fund, which pays for the vast majority of the state’s operating costs — including health care and social service programs that incur expenses because of smoking. A second pool of money stems from a lawsuit Connecticut and 45 other states settled in 1998 with the nation’s four largest tobacco manufacturers. Besides agreeing to curtail certain marketing practices, the industry agreed to pay — in perpetuity — to offset the cost of treating people with smoking-related illnesses. While the settlement didn’t require the money be used on anti-smoking efforts, Connecticut legislators created the Tobacco and Health Trust and entitled it to all settlement funds not designated for some other purpose. But since 2000, only about 10 percent of the nearly $2 billion Connecticut received from the settlement has gone to the trust — just under $200 million. And even money that’s gone into the trust fund hasn’t always been available for anti-smoking efforts. Six times in the past decade, lawmakers took the trust fund’s money to help balance the budget — a total of more than $113 million. Officials have also assigned the trust fund to pay for other programs, some of which have little relationship to tobacco, like $13 million for then-Gov. M. Jodi Rell’s Charter Oak Health Plan or $3.5 million over several years for a health information sharing network at the UConn Health Center. 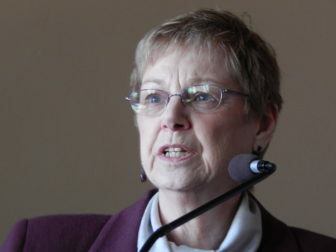 Pat Checko, a longtime anti-tobacco advocate and member of the Tobacco and Health Trust Fund. “There’s been a long history of, I don’t think there’s any other word to use but abuse of the fund for its intended purposes,” said Pat Checko, who has served on the trust fund’s board since 2000. She also serves on the board of the MATCH (Mobilize Against Tobacco for Connecticut’s Health) Coalition. The state faces significant expenses associated with smoking. Medicaid alone pays $430 million in health care costs related to smoking, according to the state Department of Public Health. That means the effects of smoking have made the budget harder to balance. But advocates say not enough is spent on helping smokers to quit or preventing kids from starting. “We have a significant amount of money that’s coming in from smokers who are paying taxes on this product they are addicted to, and we should be providing services and resources to help them quit,” said Ruth Canovi, public policy manager for the American Lung Association of the Northeast. Smoking in Connecticut has become largely a habit of the poor, those with the least education and people with mental illness. Overall, 16 percent of Connecticut adults reported that they smoked in a 2012 survey, the latest the state Department of Public Health has made available. That’s more than 400,000 adults. And an estimated 27,000 middle and high school students smoked in 2011. People who earn less than $35,000 a year are nearly three times more likely to smoke than people earning more than $75,000. Nearly a quarter of high school dropouts smoked in 2010, compared to 6.9 percent of college graduates. Hispanics and blacks are more likely to smoke than whites. More than one in three people in the state with a mental illness smokes, according to federal figures. And among people entering Connecticut jails and prisons, 60 to 70 percent smoke, according to a state correction official. Close to two-thirds of smokers want to quit. Some are Jane Reardon’s patients — people with lung disease, some with such shortness of breath they’ve had to quit their jobs and stop participating in family activities. Reardon described her patients to the Tobacco and Health Trust Fund’s board during a recent public hearing. She asked for additional funds for her hospital’s smoking cessation work — and for the state to devote more of the settlement money to helping people to quit. But legislators have been finding new ways to spend the settlement dollars that don’t include anti-tobacco programs. Checko, who sits on the Tobacco and Health Trust Fund board, said she doesn’t have a problem with using the settlement money — not the tobacco trust fund — for non-health purposes. But other anti-tobacco advocates worry when the pool that feeds the trust fund gets put toward other things. Since 2000, The Tobacco and Health Trust Fund has received a little under $200 million. The trust fund’s board has only put about $24.5 million toward anti-tobacco programs since 2003, though. It’s funded programs including a telephone QuitLine for smokers trying to kick the habit and anti-tobacco marketing efforts. The board is expected to award another $3.5 million in the coming months. The rest of the money, close to $170 million, has been either taken for the general fund to balance the state budget or committed to fund programs by legislators, not the board that oversees the fund. Some of those earmarks have funded asthma programs and Medicaid coverage of smoking cessation. But others have little to do with tobacco. Legislators have assigned the fund to pay for autism-related programs and a program that gives seniors information about social services. Since 2010, $500,000 or more a year has gone to support regional emergency medical services councils. “I think the sad thing is the public really believes that that money is being used for what it’s supposed to be used for, because they really don’t know, and many of the legislators don’t really know the difference between the settlement money and the Tobacco and Health Trust Fund,” Checko said. This year, the Centers for Disease Control recommended that Connecticut spend $32 million annually on anti-smoking efforts. That’s more than the trust fund’s board has been allowed to dole out in total since it started more than a decade ago. Few states spend even half of what the CDC recommends they spend on anti-smoking efforts, according to the advocacy group Tobacco Free Kids. But Connecticut ranks among the lowest. Sen. Beth Bye, D-West Hartford, who began this year as co-chairwoman of the budget-writing Appropriations Committee, said that while tough choices had to be made during lean times, most of the dollars spent outside of the trust fund board’s purview had some connection to health care. Still, Bye said, it’s important that state officials try to expand anti-smoking efforts and give health care advocates a larger role in that process. But carving out more funds for anti-tobacco programs could become more difficult in the coming years. Settlement payments are projected to drop significantly over the next few years. Connecticut received $193 million this fiscal year, but is only slated to get $116 million in the fiscal year that begins July 1. And the numbers drop steadily over the next three fiscal years, falling to $88 million by the fiscal year that begins July 1, 2017. Further complicating matters, nonpartisan analysts are projecting a nearly $1.4 billion budget hole in 2015-16, the first new budget after the November elections. That gap, almost 8 percent of annual operating costs, typifies the conditions that led legislatures and governors to raid tobacco funds in the past. Sen. Rob Kane of Watertown, the ranking Republican senator on the Appropriations Committee, predicted that state government would divert tobacco funds away from anti-smoking programs — and from health care in general — after the election, if Democrats retain control of the governor’s office and legislature. Legislation last year suspended the activities of the tobacco and health trust fund board for 2016, although a measure passed this year restores the board’s ability to meet that year. Gian-Carl Casa, spokesman for the governor’s budget office, said the Malloy administration has no plans to eliminate the Tobacco and Health Trust Fund board. “To suggest anything else is mere speculation, and speculation that’s not based on what we actually did this year,” he said. Casa added that the governor has taken several steps to discourage smoking among young people, including signing legislation to ban the sale of e-cigarettes to minors and the sale of loose cigarettes. Even so, anti-smoking advocates say they’re concerned about the future of the dedicated fund for anti-smoking and health efforts. “There is definitely a fear that they may just zero out the Tobacco and Health Trust Fund altogether,” he added. But ironically, Johnson said, there’s one thing working in the favor of the trust fund’s continued existence. “Because a lot of the money in the trust fund is allocated to non-tobacco-related programs, it broadens those of us that advocate strongly that the fund continue to exist,” he said.